Before & After School Programs - Call Our Owasso Childcare Experts Today! Our before and after school program serves children who attend local elementary schools. Children are supervised from their arrival in the morning until their departure for elementary school and when they return in the afternoon until they are picked up by 6:00 p.m. Our goal for this program is to provide a safe atmosphere for relaxation, play time, homework, and enhancement of the school day. In addition, the program encourages independence, cooperation, sharing and fair play. The program is designed to maintain a delicate balance between structured and non-structured time. This program includes breakfast and snack for before care and after care, and during all day care includes lunch. If your child is attending a local elementary school near Owasso, Cross Timbers Preschool & Daycare offers before and after school programs for children who need additional supervision. 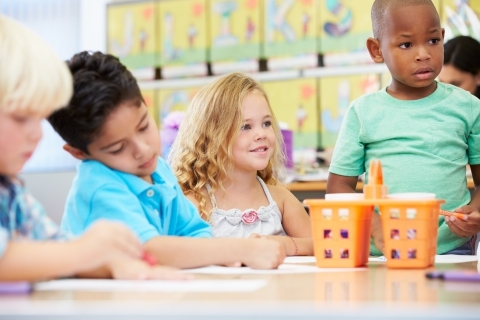 Our child care specialists are dedicated to providing your child with a safe and relaxing environment to socialize and work on homework assignments in, encouraging individual independence at a young age. We also offer an array of preschool and daycare services including an infant program, toddler program, pre-kindergarten program, private kindergarten class, private first grade and summer camp. If you’re ready to take the next step in your child’s education, schedule a walkthrough of our educational facility today!